Fabric Mart Fabricistas: Made by a Fabricista: Bright Pink! There are so many wonderful colors to choose from! I simply LOVE this stuff! It washes and dries beautifully and it's made from completely natural fibers, so it sews and presses like a dream. Need I say more??? Before I cut into my fabrics for this monthly post, I try and do some research. 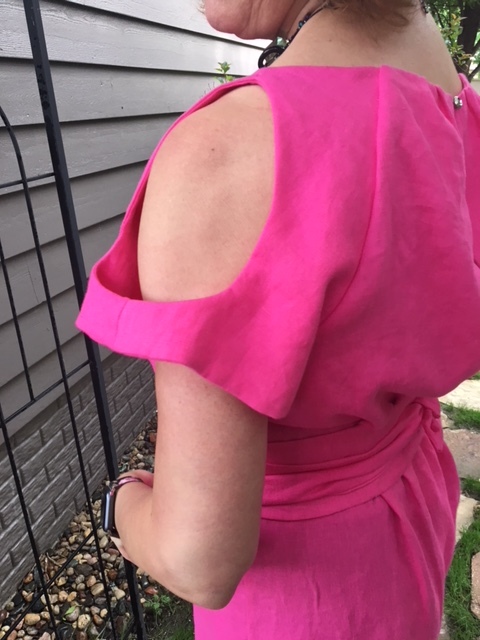 For this month, I looked for summer dresses with easy silhouettes and fun sleeves. This is the dress I came up with. 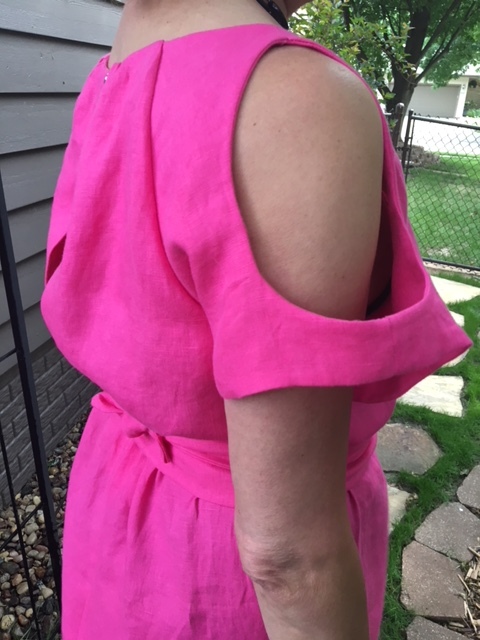 I really love those sleeves and I had read from several reviewers that the sleeves were fully lined and clever. Sold! 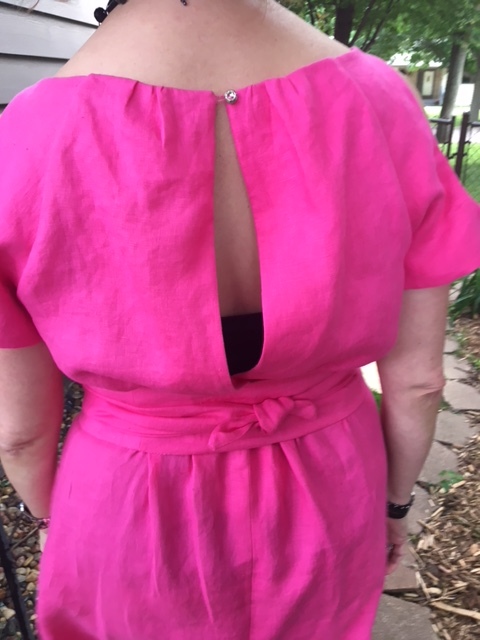 I was a bit worried with how low this dress back slit is on a 50+ lady, but it works just fine! 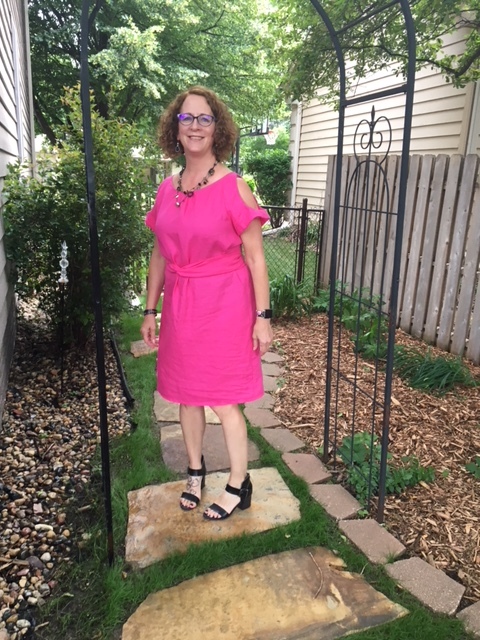 And this linen, the dress calls for linen, so it was a match made in heaven! 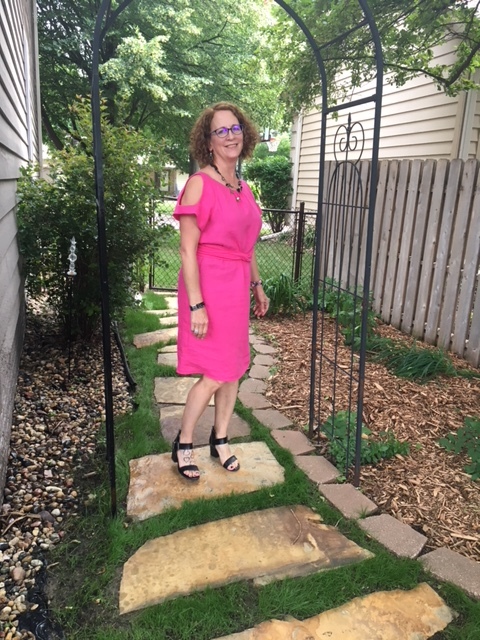 Pink is such a fun color to wear! The linen gives this dress structure, yet also lets it drape a bit, not in a flowing sort of way but in a way that works for the dress. Here's a closer-up of that back slit. I am wearing a cami. I choose black so I could wear my black sandals. Here is a closer-up of the sleeves. These are made and constructed in a way that the sleeve itself has no seams exposed. Very clever and what a nice finish it gives! I so love FM's linen section. If you never used it, what are you waiting for? Cute dress. Looks great on you! Beautiful dress. What is the color name is this linen? This linen is simply called bright pink. I think the name is perfect for this color! Love it and the pink is fabulous! Thank you so much! I love pink! Looks great. And your fit is batter than on the cover model picture! Lovely dress and color!!! I adore your eyeglasses!!! Your dress, and you in it, look beautiful. Women worry wa-a-a-a-y too much about what they can wear after a certain age. At 77, I'm really not concerned with what a 40-something fashion editor thinks or whether the style choices of 19-year-olds might limit my choices. (They don't.) You did exactly what I would have done - you wore the old miracle cami underneath. Styling is everything, and makes wearing an endless variety of styles possible. Aw, thanks so much! You are right, I do worry too much! Having said that, no one will see me in a midriff-revealing dress at my age! Great match of pattern and fabric! Thanks for the inspiration! Thanks! How nice of you to say! Your dress is gorgeous! You look absolutely beautiful. I love checking out your creations. What a nice color, and style. You are working it!